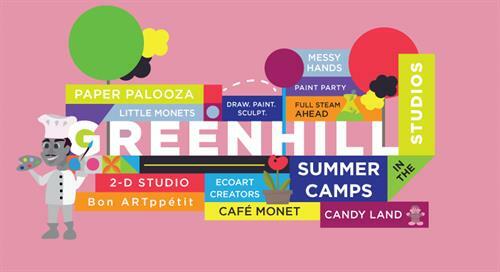 Summer Camps at GreenHill provide the perfect nurturing environment to inspire creativity and learning for curious kids of all ages. Small group sizes, experienced facilitators, access to GreenHill?s galleries and studios make each day a fun-filled adventure. Week-long camps are themed and geared towards ages 4 years to rising 6th graders. Camp is $125 per camper unless noted otherwise. To register and more information go to www.greenhillnc.org/summer-camps.